This is the sunflower that I grew in my garden this summer. It’s in a little bed at the back of the house, which is in between the back staircase, and the wall of the house. I also have lavender, oregano, lemon balm, a tomato plant, nasturtiums and a few other random things in the bed. The sunflower grew so tall and luscious! 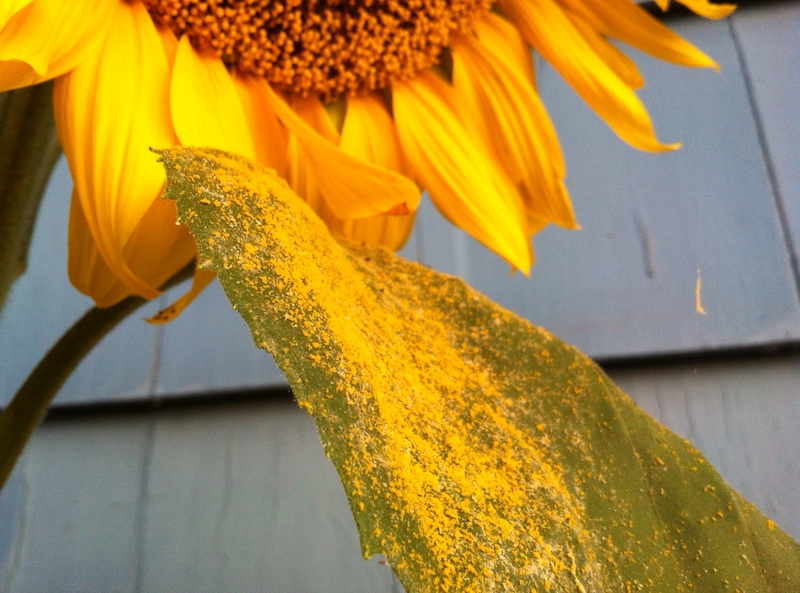 When I went out a few days ago to look at it, I saw all this pollen that had fallen on the leaf under the flower. I just loved it. It makes me feel like the flower is having its own Holi day like in India! I’ve been looking forward to this weekend at home, for the entire last two quite-busy weeks. I’m hoping to get some artwork framed and up on our walls. I’m also hoping to scrub the kitchen floor (ugghhh… but necessary), get to the farmer’s market, and maybe even get out into my garden and play. We’ll see! And of course tomorrow, Sunday, there is the People’s Climate Forum in Sydney, which I wrote about on Thursday, that I’ll be attending. And there will also be some quality lounging on Sunday morning and evening. Awesome upcycled business cards by a popcorn company. I may be addicted to photos of other people’s weddings. But these ones of a New Brunswick wedding are simple + beautiful. I especially love the bride’s dress, their vows, and the cool wall/frame thing at the end! A gorgeous collectively-written blog about gardening, called Tend. I’m really excited about this Celtic Colours Community Meal next month. Cookies, delivered by bicycle! A Halifax business that really should branch out to Cape Breton. I’m not ashamed to say I want this mug. Don’t follow the money, follow your heart. Have an absolutely fabulous weekend, my dears!! Dream big, yo. This entry was posted in Art, Community, Day to Day Life, Design, Food + agriculture, For Fun and tagged Links Loved. Bookmark the permalink.